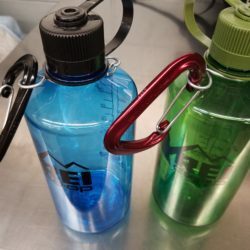 Traveler(s): Pat Difficulty: Easy to Moderate Nalgene, in my opinion, the most convenient way to cart water on the trail. Keeping those Nalgene bottles harnessed now that a different story. Nalgene has a great warranty, but doing without your beloved Nalgene bottle till returned is not favorable. Today’s post is a way to remedy this problem.